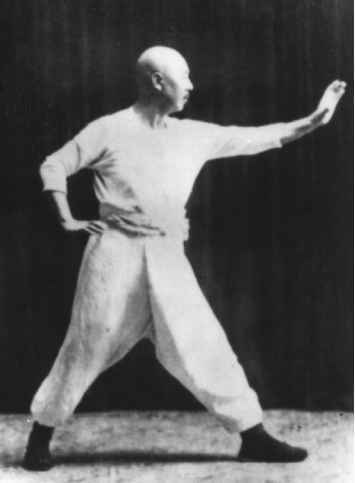 the West who practice Ba Gua and Xing Yi because he lived longer than most of them, he was featured in Robert Smith's books, and he taught many foreigners (both Westerners and Japanese). His 5'8", 260 lb. frame was also not easily overlooked. Although Wang was a prominent martial artist in Taiwan, not many martial artist know that he was even more prominent in religious circles, and it was because of his religious prominence that he was brought to Taiwan. In Tianjin, Wang Shu Jin was a leader in the religious sect known as Yi Guan Dao if ¿1.). Yi Guan means "consistent" or "unwavering," Dao means "Way." The practitioners of Yi Guan Dao refer to it more as a philosophy than a religion. In his book, Ba Gua Lian Huan Zhang, Wang Shu Jin states that after having spent a short time studying with Zhang Zhao Dong he became interested meditating, Buddhism, and becoming a vegetarian. Zhou Yi Sen says that Wang became an Yi Guan Daoist when he was in his early twenties. It is not known if Zhang Zhao Dong was an Yi Guan Daoist. % ). When I interviewed Zhang Jun Feng's wife, she stated that the reason Zhang Jun Feng and Wang Shu Jin were such good friends and had such mutual respect for each other was that although Zhang was senior to Wang in the boxing circles, Wang was senior to Zhang in Yi Guan Dao. 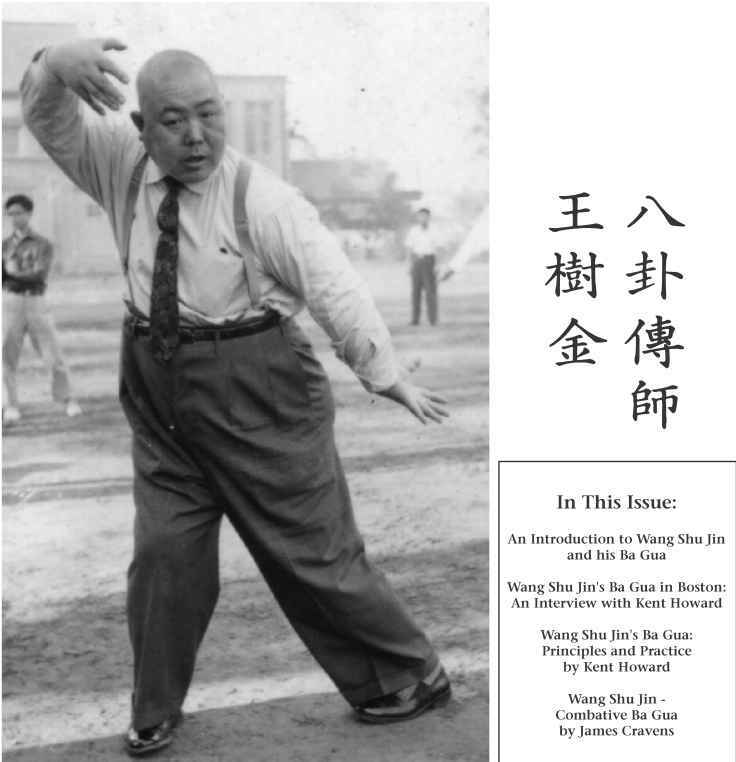 In his first book, Wang mentions that in 1951 he and Zhang Jun Feng began practicing martial arts together. Wang Shu Jin was brought to Taiwan on September 27th, 1948 by a fellow Yi Guan Daoist, Zhou Yi Sen. In an interview conducted with Zhou, now in his eighties, in September 1992, Zhou said that in 1947 an Yi Guan Dao leader had died in Shanghai and he had gone to the funeral representing the Yi Guan Dao from Taiwan. While at the funeral, Zhou met Wang Shu Jin and because of Wang's stature in the Yi Guan Dao community, he asked Wang to come to Taiwan and help him with the Yi Guan Dao movement there. Zhou said that at that time Wang Shu Jin was an important figure in Yi Guan Dao in the mainland. Yi Guan Dao, which is a practice based on Daoist philosophy but embraces all five of the main religions in China (Daoism, Buddhism, Muslim, Christian, and Confucian) as "differing expressions of the same universal and unwavering Dao," originated in Shandong Province and was first called Xian Tian Da Dao (tL^^jI - pre-heaven great Way). In 1928 the mainland government suppressed the religion. This was due partially to the fact that members of the five main religions were a bit unnerved by people who accepted all of the various religions as holding equal truth. Anytime an individual decides to learn how to protect themselves, learn self defense, or become a better person, one thing comes to mind - Martial Arts. 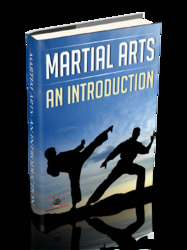 Martial Arts are now being practiced all over the world.